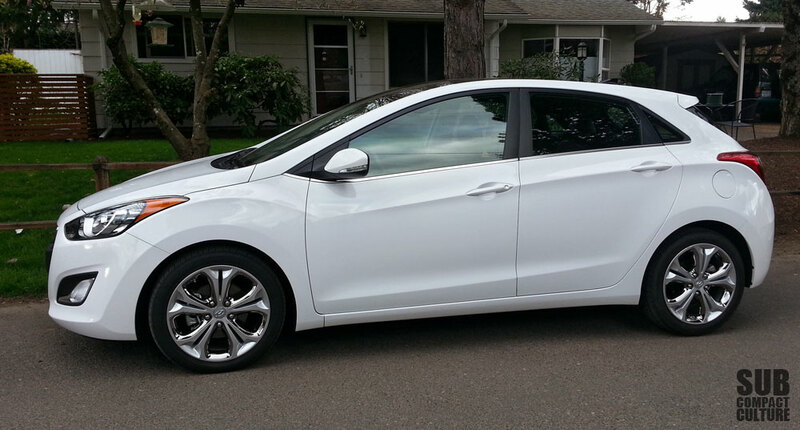 We're back on the review junket, and in the driveway this week is the 2013 Hyundai Elantra GT. Frankly, I love the looks of this compact hatchback. It's edgy, sleek, and modern without being garish or boring. So far, the only thing GT about it is the looks and its adjustable steering ratio, which has a taught sport setting. Other notes: Great stereo, a super-cool panoramic glass roof with a really sweet sun shade (I'll get a video to show you what I mean), and plenty of space. We tested the Elantra Coupe not too long ago and found it tepid in terms of excitement, and the GT has the same engine/transmission combo. However, it's far more practical and we think it looks better, too. I like this car in the way that it is practical and it looks different. Hyundais just dont drive the way I would like them to; they have this hallow feeling like its made out of tin cans and gum wrappers. I can't describe it in words. Interested to see how you think it drives and handles.